Join the discussion on our forums! 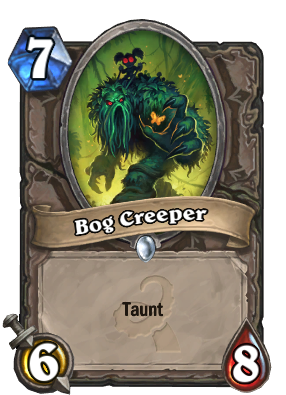 Come discuss Bog Creeper over in our dedicated Bog Creeper discussion topic. 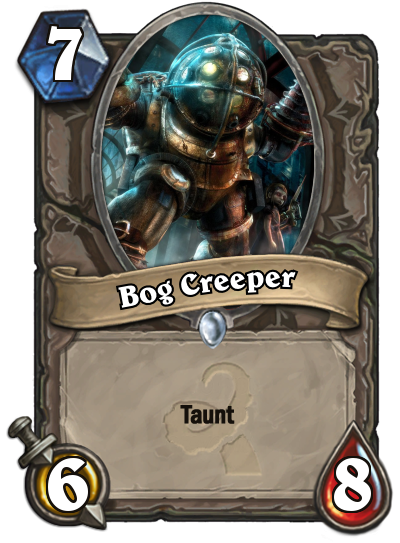 He's tried other things, but bog sidling, bog ambling, and bog trundling just aren't as effective as bog creeping. This card is broken in arena. Beast of a card in arena. "Used in 0.92% of all decks" I can't believe he's so unpopular! He's a solid 7 drop in standard(No Boom) which is almost as good as that 5/10 Druid taunt but isn't hard countered by silence. Such an annoying card in arena. Expansion MVP. It's working great on most of my deck, and I can already say it is by far the best 7 drop in the whole game now that Boom is out. Working great for me in my control decks. Huh...a common vanilla minion with taunt and good stats. Not too bad. 6/10 Love that artwork too! A constructed-playable French vanilla neutral common. Well I'll be damned. Best neutral independant 7 (hogger requires synergy) it's also stated well so it's goos in midrange decks that aren't C'thun, warrior,druid. If they want a good 7 drop to survive, this is a card for you. Powwrcreep over ironbeak protector btw. it's actually quite good..6/8 taunt for 7 is really good it's like ancient of war which loses less on silence and trades very well with almost anything it's not dr. 7 but you know..